Photo Actual patient. Results may vary. THERE’S ONLY ONE BOTOX® COSMETIC. 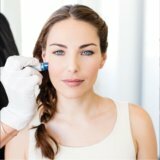 Ask for BOTOX® Cosmetic by name. 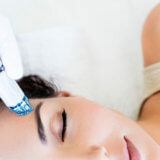 WHY BOTOX® COSMETIC IS MORE THAN SKIN DEEP. Repeated muscle contractions from frowning, squinting, or raising eyebrows cause skin to furrow and fold, gradually resulting in the formation of facial lines. BOTOX® Cosmetic is a quick 10-minute treatment that works beneath the surface and temporarily reduces the underlying muscle activity that causes moderate to severe frown lines, crow’s feet and forehead lines in adults – to help them look better. WHAT TO EXPECT WITH TREATMENT. Some patients receiving BOTOX® Cosmetic report the injections feel like a pinch. You may begin to notice a visible smoothing of frown lines, crow’s feet and forehead lines within 24 to 48 hours, with results lasting up to 4 months for moderate to severe frown lines.BOTOX® Cosmetic is not a permanent treatment. If you discontinue treatment the moderate to severe frown lines, crow’s feet and forehead lines will gradually return.